Years ago I interned at the Raleigh Hand Center in North Carolina because I thought I might pursue being a hand specialist, and then I switched to cancer research, which now I know is my calling. I worked with so many athletes with finger injuries and as a retired elite gymnast, I never thought I would walk in that clinic as a patient. However, on October 2013 I visited the Raleigh Hand Center because I indeed injured my finger. For weeks I had constant pain and a swollen knuckle. We thought I tore my ligaments or tendons and indeed, I almost did. When the hand surgeon showed me the X-Ray, I said, “wow my middle finger ligaments have ‘slack’ in their system!” Anyhow, as a climber, I have never had an injury that required medical attention. For the first time I realized, I was not climbing invincible. And not sure why that never registered in me because I increase my risk in climbing by traveling everywhere to climb everything. For the first time, I backed off climbing anything hard for about 5 months. I climbed LOTS of moderates and specifically focused on soft and precise toe work, practicing overemphasizing all kinds of body movement/technique (back stepping, heel hooking, knee drops, etc. ), focused on lapping for endurance and so on. So a 5.6 to 5.8 no longer was boring, I made rules from the ground and did everything possible to build my climbing skills, so that when I did get back to 10s and up, all of that technique would be second nature. Outside of climbing, I really tried to work on strengthening my core and body overall, and those legs, so that I could learn even better foot and leg work, and ease off the hand when possible. And thanks to Mr. Beav at prAna, I was inspired to do 10 minutes of Yoga every morning just before I drink my coffee, and still at it today. I am not 100% healed, but almost there. This week, I realized I still have some limitations because taking 4-5 months off on the finger means both fingers lose a certain amount of grip strength. If I do too much finger exercises, I can re-injure my middle finger or more. 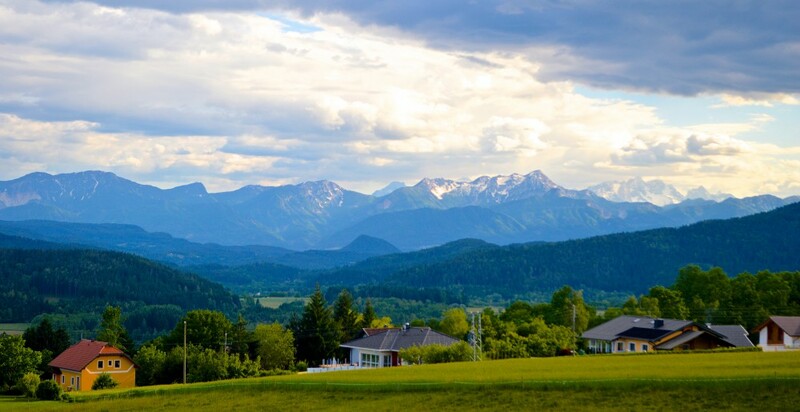 If I do not do enough and I get on more challenging climbs, I will pump out and potentially injure my finger again. Anyhow, this journey has been tough because I love challenge and being pushed to my limit. 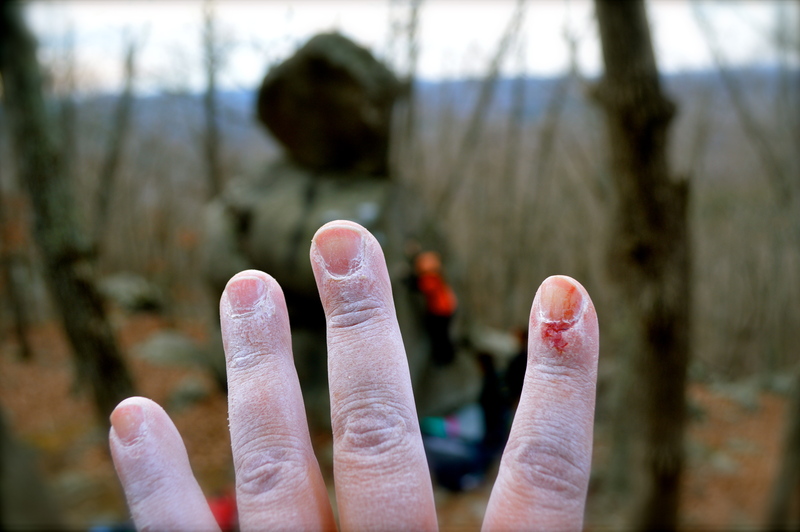 I have learned to back off a climb when my finger hurted on a certain hold. I learned to enjoy and really get a massive workout only climbing moderates (yes, can you believe that!?!?). And did it pay off? Yes, just yesterday, I finally was able to get up almost every climb and although my finger grip is not quite in balance with my climbing ability, it actually feels like my finger just promoted me from ‘ouch, I can’t bear anything’ to ‘I can actually hold onto and climb a lot of things’. Next up, is getting my finger and forearm strength back slowly, but surely. I posted on the Climbingjourney Facebook page asking readers for recommendations on how a climber can get finger grip stronger and I received many many messages. Thank you so much! 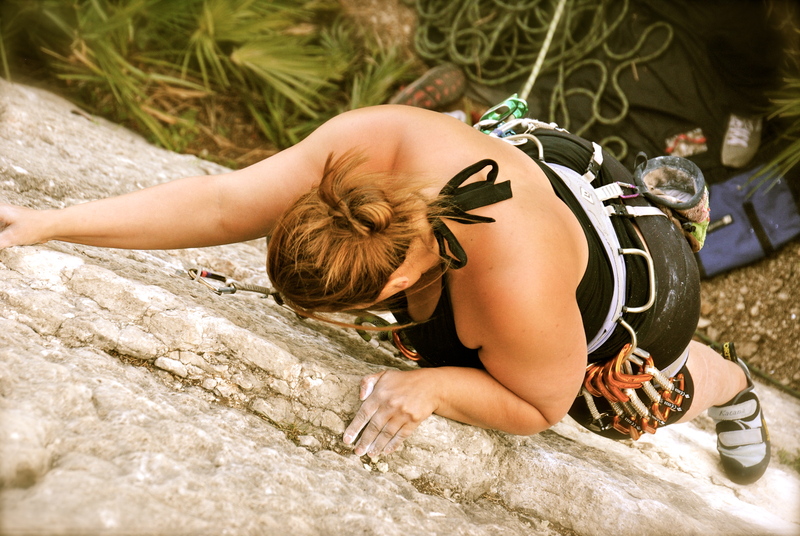 Out of many ideas, I picked out ones that best suited my injury, recovery and 2013 climbing goals and added them to my workouts. Here is a the top 10 tips that were consistent in many of messages from readers. Hope in reading through these, you will find one or two as well that will work for you. There were so many messages, so sorry if your idea is not included in here, but here are some words of wisdom from one climber to another. Reader Michael suggests: Point with the tip of your finger (keeping your finger straight) and draw your ABC’s (just for injured finger), finger tip pushups, reverse curls after every time you climb 20lbs+, on a large sloping volume (or you can make your own wooden one for home use-designs online) sloper pull-ups, lock offs/one leg one hand/ one hand hanging (also make sure to do every grip type especially under cling as it will help balance your build and prevent future injury), heavy finger rolls (only do these if your sure your back; a nice modification instead of the straight bar with your body weight is to take a half your weight dumbbell and get into row form and perform finger roll). HIT strips-which can be copied for at home use by simply using wood screwed to plywood (cut small 4inch sections of 2×4 for pinch holds, roof traverses, weighted 4×4 bouldering. Reader Kenan suggests: Actually had the same issue two years ago before nationals. Fill a bucket with sand. Or get some stretchy kind of resistant putty. Put your hand in the bucket and try to open your hand up as far as possible. To strengthen those fingers you need to work on the opposing moments. 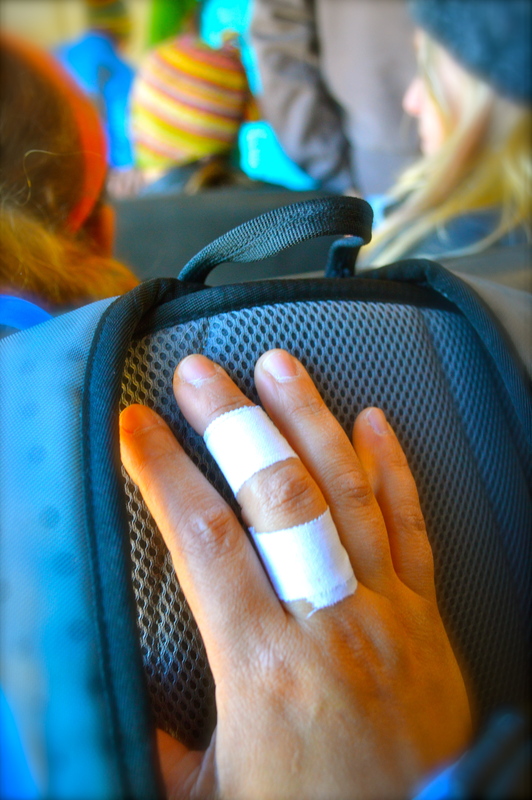 Reader Dave suggests: I’ve had the same problem in my right ring finger a few times. The thing that helped me is called contrast therapy. Essentially you fill two buckets: one with ice water and the other with hot water. Start by dipping the affected hand in the ice water for one minute then immediately transfer it to the hot water. Switch back and forth every minute. Always start and end your therapy in the ice water. It’s not fun. It’s very uncomfortable. But it does promote good blood flow and heals your soft tissue VERY quickly. Reader Sapphire suggests: Start hang boarding. You can start at the lowest bar and be on your tippy toes (meaning they touch the ground) and NO this is not cheating! Hold for 10 seconds, 20 seconds, 30 seconds, then 30, 20 and 10. Keep doing this for a few months and only after this then try to slowly take your weight off. Don’t get so eager to take your weight off so soon or move up the steeper bars. Finger muscles are small plus you are mending from an injury. Take your time and eventually later this year (YUP) you will be slowly become a hang boarder! Reader Tiffany suggests: I am sure you are getting lots of recommendation for the fingers and thumb, which is important. But also remember to strengthen your forearm. My coach has us do dumbbell exercises where we have our wrist facing up and should be straight, and gripping the dumbbell. Slowly lower the weight, but wrist through elbow should be straight. If you cannot do 8 reps lower your weight, if you can do 10 easily, up your weight. I think my coach calls them forearm curls. Then we get back in the wrist facing up position, and twist the dumbbell side to side, but the forearm through elbow needs to stay straight and controlled. Last, we then hang on our pull up bar until we exhaustion, or slide off. We do it 4 times. Sometimes we even hang on one arm, while shaking the other off, and rotate every 10-15 seconds until exhaustion. Good luck! Reader Tanner suggests: I like to once per week hang on holds for 10 or so seconds and repeat three times. Best is to go to the bouldering section of your gym. Start with a juggy hold, but eventually find different holds, sloper, crimpy, round, flat ledge, those brain looking holds, and so on and hang. I try to find 5 different types of holds and hang for 10 or so seconds and do it three times. 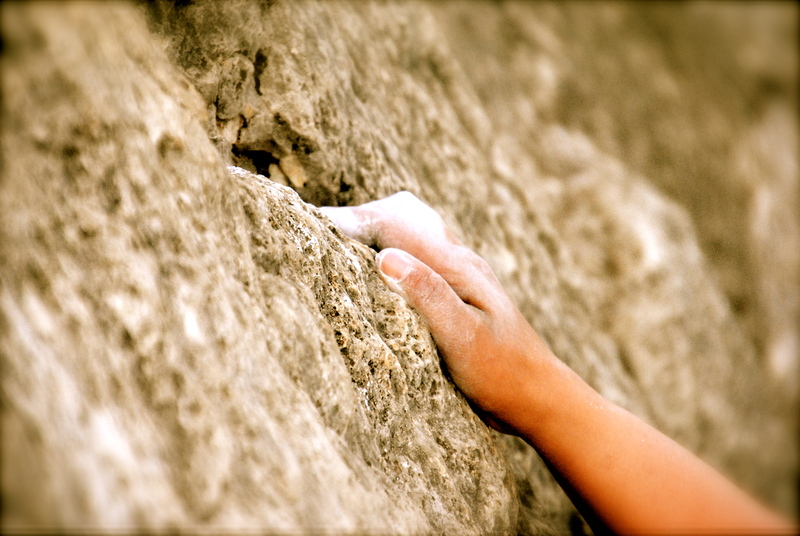 When you are ready, make sure to advance to the crappiest holds out there, super slopey, hard to grip or hold on to. 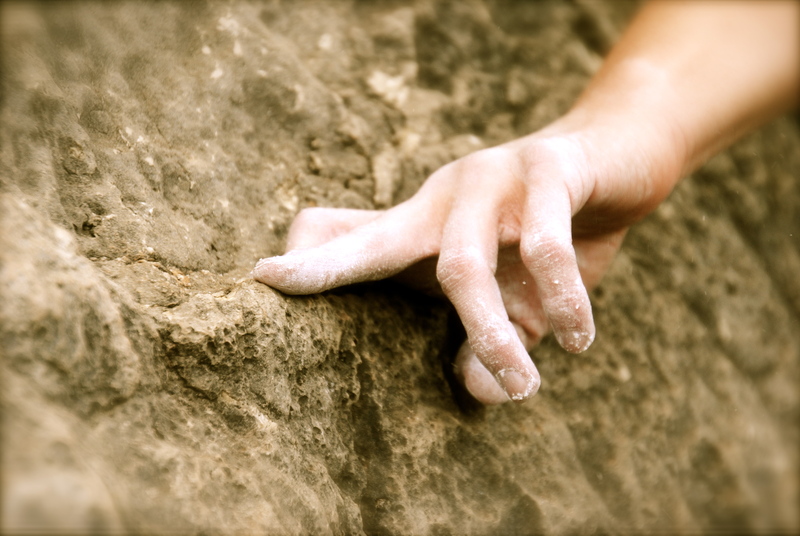 The point is that if you can hold on for 10 seconds, you can eventually build up your grip strength in positions required for climbing. Anyhow, I learned this from a friend, and months later, I felt the difference, but you can only really gain benefit if you look for not so easy holds. If you practice this exercise with jugs, what is the point? Reader Joe suggests: If you have the equipment, do assisted pull-ups in various positions: shoulder width traditional, wide, and mixed grip. I suggest assisted so you do not have as much weight on your finger grip and can also work on your upper body strength. Eventually ease off on the assisted weight slowly until you can do it with little or no weights. And if you do too many pull ups, you can hurt your elbows. Anyhow, when I had my finger injury, I could not do pull ups because of hanging on my fingers and once I could, I knew I was headed towards recovery and the pulls ups just helped me get stronger for hanging on my skeleton. Reader Jaime suggests: DPM came out with an article years ago The Way of the Iron Fist and involves a rice bucket. 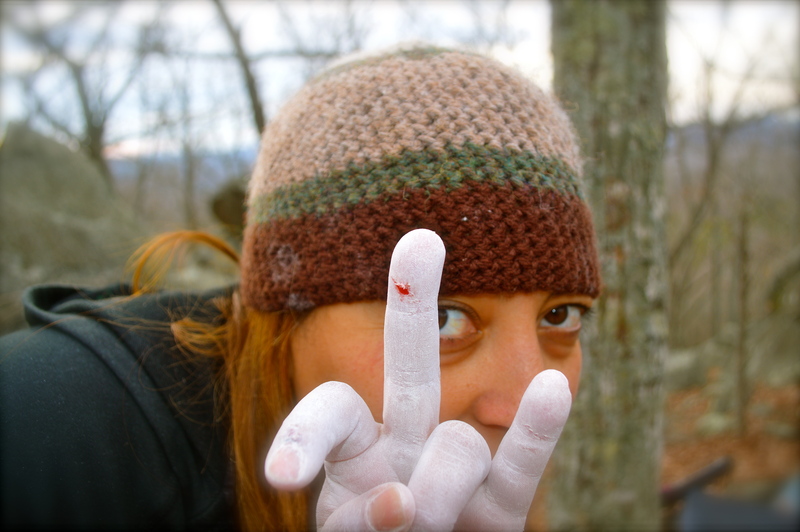 I love it, here is the link to the article: http://www.dpmclimbing.com/articles/view/way-iron-fist. 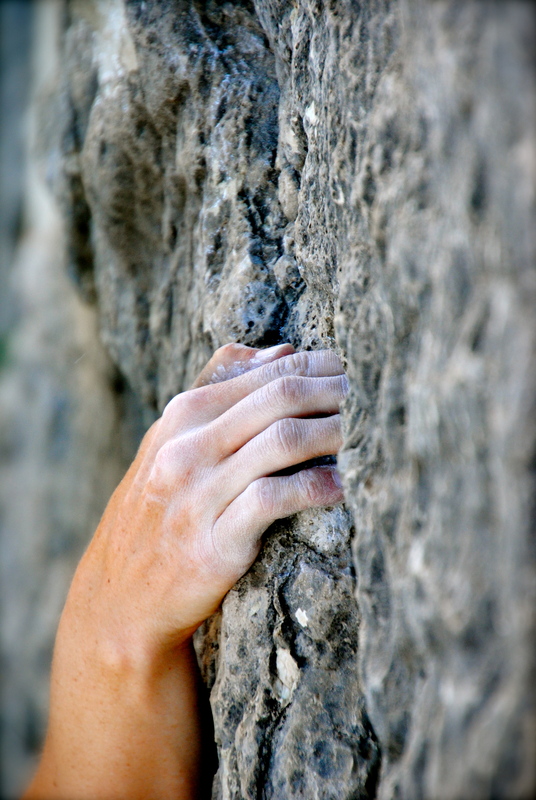 Reader Austin suggests: I came from a recent finger injury and after surgery, PT well then I was really trying to advance in my climbing again. I did a lot of research so if I had one of many things I put into a spreadsheet (I do everything in a sheet by default, I am an engineer! ), I did find this website called body results http://www.bodyresults.com/e2fingertraining.asp. Here is more info for beginners, but if you click on the link to the 2nd question, you might find some helpful information. Basically search all over and pick out what works best for you, it can be overwhelming, like a top 10 list and stick with it. Good luck! Thanks again all for your ideas, and encouraging me through my journey in healing this crazy finger!